Anyone who thinks that sensory play is just for toddlers needs to see this post. Since making the swamp sensory tub last year my kids have asked to do another one just like it. 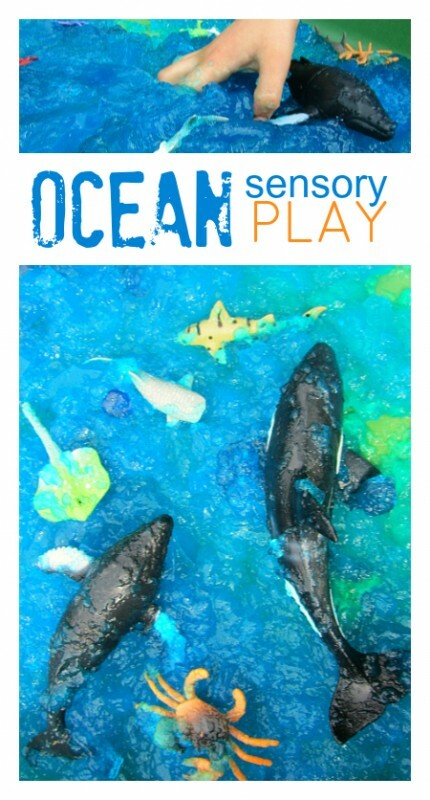 I didn’t mean for so long to go by but we finally got around to it and this time made it into an ocean sensory tub with blue gelatin. 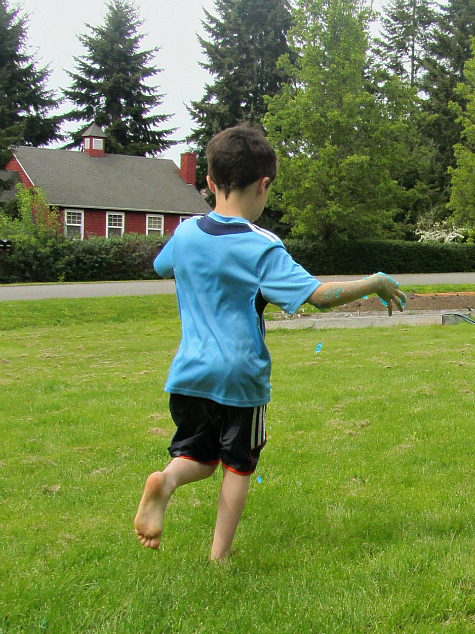 Play like this is fun and simple and perfect for summer . We leave ours out covered in our yard for a day or two and observe how the gelatin changes throughout the day. Please note that we live in the PNW in warmer climates leaving it out may not be a good option. Gather your materials. 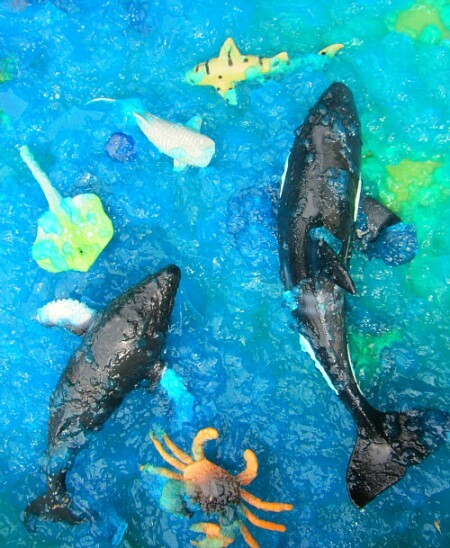 You will need a container to make the gelatin in, a large container to play in, some fun sea animals and glass pebbles, plain gelatin ( I used 5 boxes) and some blue food coloring. You will also need a little bowl, scissors, many cups of water and a pot or kettle for the boiling water. 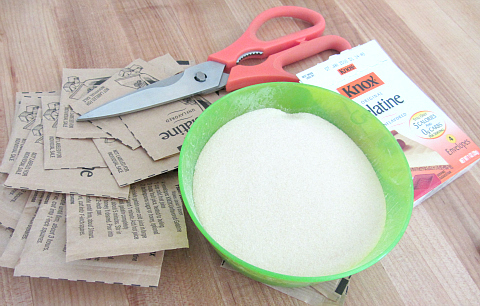 Start by pouring all the gelatin into a little bowl – 5boxes = 20 packets of gelatin. Boil 5 cups of water . 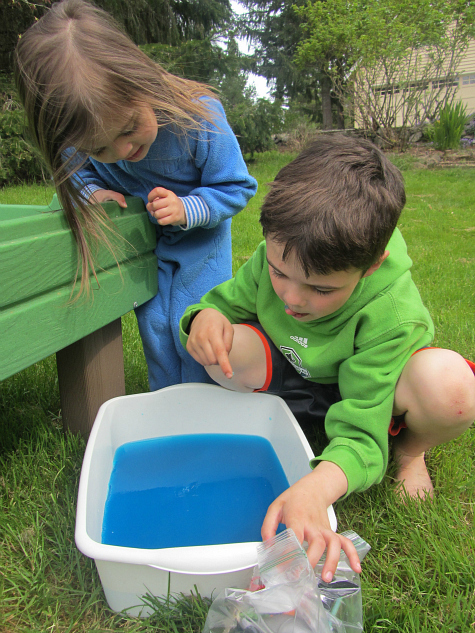 Add a few drops of blue coloring to the water. Pour 15 cups of cool water into your container. Sprinkle the gelatin on top and let rest for one minute. Pour the boiling water in and stir until the gelatin is dissolved. 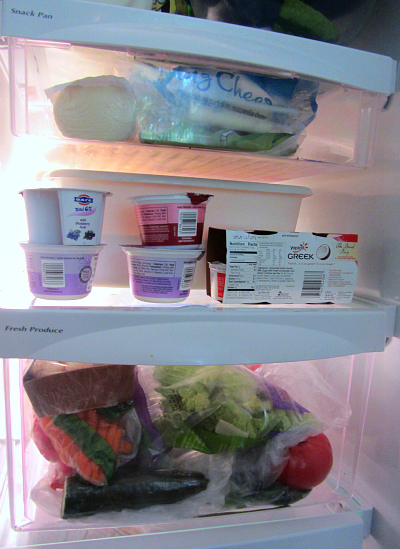 Hide in your fridge behind yogurt. Well that’s what I did because the last thing I wanted was blue gelatin all over my kitchen . 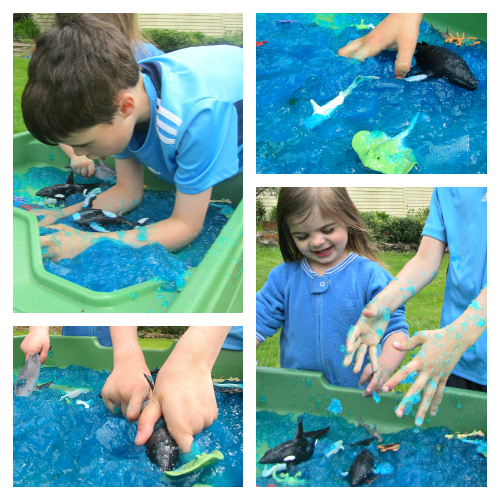 When I made the rainbow gelatin sensory tub I spilled some blue and it it forever to get that stuff off. 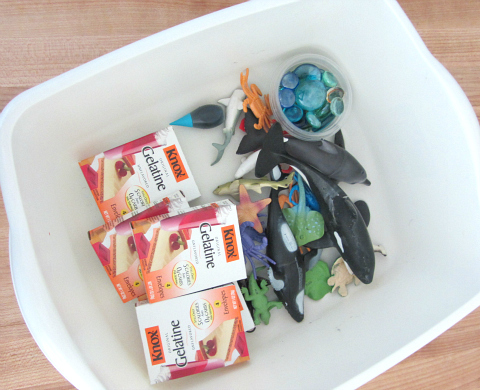 When the gelatin is set about 3 hours ( ours was a little under done but the kids were eager) grab the sea animals and get the table prepared. Then we added the gelatin. Play!! Clearly the 6 year old was into it. Literally. Because ours was a little under done it was stickier than normal and required more washing off – so they ran to the water in our yard and cleaned themselves off. I love it! I’ve pinned to to my Oceans board for the next time we circle back around to it, but in the meantime I’m trying to figure out where I can include the gelatin mixture for my kids! Soooooo much fun! Definitely an outside activity! 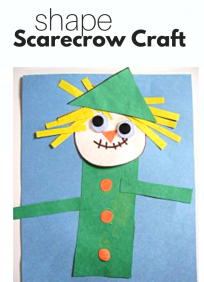 I’ve recently just started these in activities at home! Love all of your ideas. 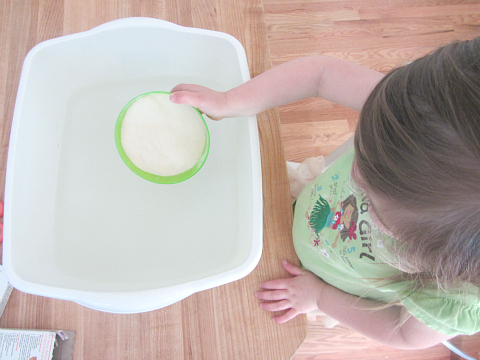 Is your sensory table just a water table? And did the table already have water in it when you dumped the gelatin in? no water in first just gelatin. This looks great! I haven’t set up any gelatin tubs yet. Is there a reason why you’d use powdered gelatin instead of blue Jello? 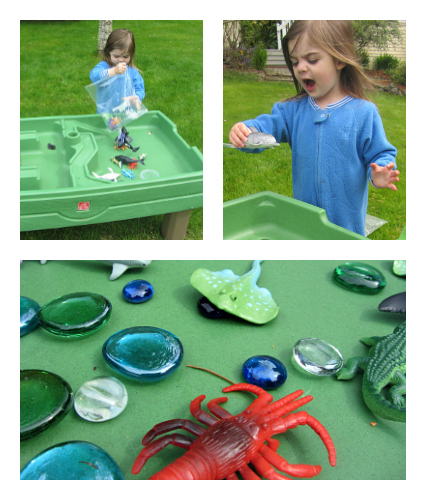 Where did you purchase your sensory table? Thanks! How many ounces is each box of gelatin? We have that same water/sand table and my daughter will have so much fun. Thanks for sharing! Love this idea! When you say it was difficult to clean up… Because it stained or just because it was messy? 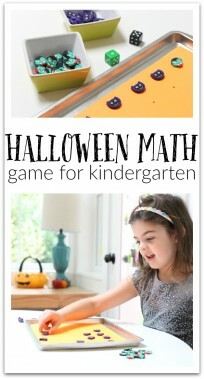 I would like to try this in my PreK classroom, but would not want it to stain the floors. I’m wondering if I could use liquid watercolor (washable) instead of food coloring. Have you ever tried that? It didn’t stain my fridge but in a classroom I would use either very very little food coloring or none at all. Clear gelatin looks great too. Boy that looks soooo fun…I wanna stick my hands in there and squish it! 🙂 Thanks for hosting the link up and I love the name of your blog. Your blog is so great! I love reading it! so much ideas… I have to try this one! Your english seems fantastic to me! Si vous voulez ecrive en francais je peut comprendre mais il a Ã©tÃ© si longtemps que je l’ai Ã©crit ou parlÃ© en franÃ§ais rÃ©guliÃ¨rement. Hello, I am super excited to try this. However, I am wondering how long I can leave it out before it must be discarded? I am also wondering how many grams per packet were in the gelatin that you used? In cool weather you have a few days. In warm you have 2 at the most.